From the intro: Rome, the best food city in Italy? Maybe. One thing’s for sure: Rome ranks high among Italy’s great food cities. It is an obscenely rich capital city and has the means to spend on quality, its gastronomic traditions are ancient, and it has some of the most demanding food consumers in Italy. They won’t buy mediocre ingredients or eat mediocre meals for long. Like New York or Paris, Rome is a talent magnet. Many of the best cooks and products from all over the country are here. Factory farming, discount hyper-markets and processed or fast food have not yet killed off Rome’s vibrant, small family-run traditional food and wine specialists, one-of-a-kind retail food shops, cafes, coffee roasters, ice cream makers, trattorias, hosterias, osterias, pizzerias, restaurants and more—much more. The best of the best feature in this app. Here’s another sampler from my new FOOD WINE ROME app, a fully functional, GPS-driven app based on the critically acclaimed, award-winning book FOOD WINE ROME, a guidebook and pocket bible to the history and culture of food and wine in Rome today. Buy the app now. Buy the book now from Indie Bound or Amazon. 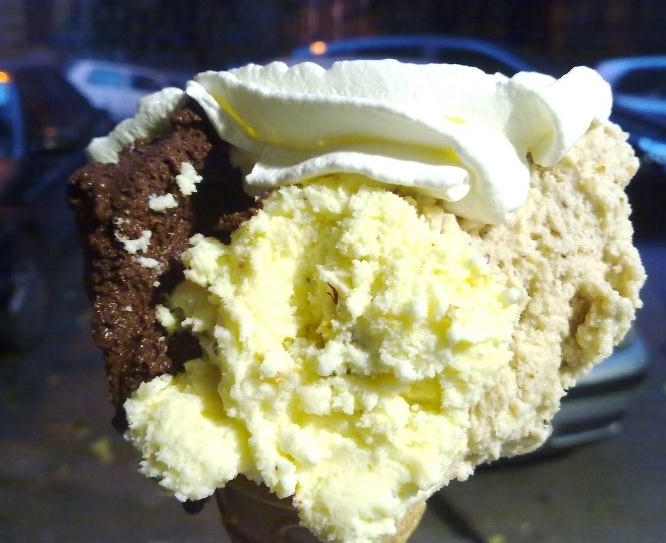 The best ice cream in Rome? Perhaps. Depends on how you define “best.” This place is certainly among my top-three favorites. 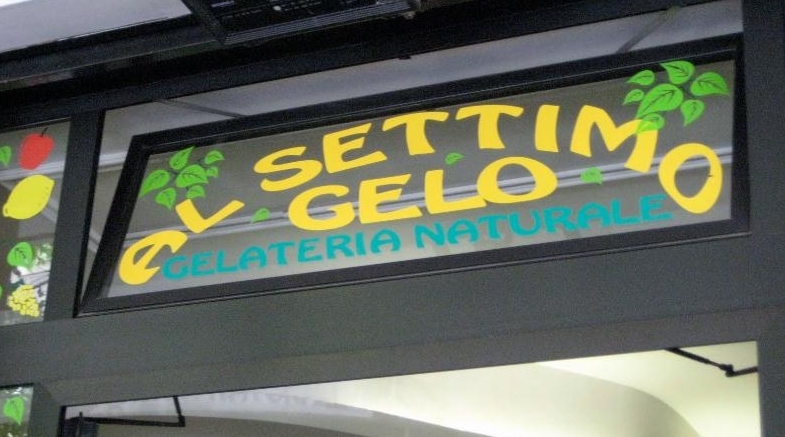 In philosophy and approach, Al Settimo Gelo is the closest ice creamery in Rome to Fior di Luna Gelato e Cioccolato and Il Gelato di San Crispino. Everything is uncompromisingly natural, fair trade, and organic. The results are distinctive. Al Settimo Gelo ice creams levitate with lightness and have a brilliancy found nowhere else. They tend toward sweetness, to compensate for a lack of fatty substances. These may be the most authentically old-fashioned ice creams in Rome (and perhaps Italy) because of their apparent artlessness. For instance, the nut flavors are pale in color, but they taste of the freshly toasted and ground nuts the owners buy and transform themselves. They’re the best nuts on the market, from Bronte, the Langhe, and Southern Italy. Even the peanut butter flavor (usually a clunker) is weightless and fresh-tasting. Scoop and poop: The fruit flavors have no dairy products in them and approach the simplicity and purity of Roman cremolato. The caffè is made with freshly brewed coffee from the excellent family-run Torrefazione Olimpica in Rieti. The shop’s name is authentically funny in Italian (a play on Settimo Cielo, meaning Seventh Heaven), and it captures the sunny character of both owners. The Vatican isn’t far away, and if the Holy Ghost was a gelataio and had a sense of humor these ethereal creations would be his. Pierpaolo Agostini was a furniture restorer and cabinetmaker before turning to ice cream. He brings his perfectionism and love of craft to his job. His significant other, Mirella Fiumanò, ran a hardware shop with her father before reinventing herself. The pair also loves spices and herbs. Tip: If it’s available, don’t miss the chocolate with peperoncino chili, or the cardamum flavor. The sumptuous yet heavenly vanilla is made with fresh vanilla beans and is flecked black with them.